What we've got here is Fuji's latest pricey—$1300 body—interchangeable-lens camera. The X-T1 packs the excellent, second generation guts (16.3 megapixel APS-C X-Trans CMOS II sensor and EXR Processor II) that were introduced last year, and have been creeping their way into some new models since. The new sensor and processor technology give cameras super fast autofocus performance, amongst other advantages. The first generation guts took amazing photos but lacked some of the zip and pop that people expect from expensive digital cameras—the second generation fixed that. Interestingly, maybe the X-T1's standout feature is its eye piece: The OLED viewfinder has some of the top specs you're going to find out there, which is important because solid EVFs are the key to ultimately replacing DSLRs with mirrorless compacts. First off, the X-T1's EVF has .77x magnification, which Fujifilm claims is the highest magnification for any viewfinder on a digital camera the world. Most top cameras, even those with optical viewfinders, linger down around .70x or .71 magnification, which means that the X-T1's going to give you a view that's closer to the size of what your eye actually sees. What's more, the viewfinder has 2.36 million dots, which is very near the top resolution these days. Consider that the well-regarded Fujifilm XPro-1 has 1.44 million dots, and the two best interchangeable-lens compacts released last year, the Sony's A7/A7r and the Olympus OM-D E-M1, both pack 2.36 million dot EVFs. While Fujifilm cameras like the X-Pro1 are clearly all about their retro design and handling, the X-T1 takes it a step further, adding a dedicated ISO dial to the shutter speed and exposure compensation dials on the top panel. Indeed, the thing's stacked with dials a bit like the nostalgic Nikon Df. We should note that while these vintage-style controls are going to slow down the handling of the camera a bit, they X-T1 has some key modern conveniences like a tiltable rear-LCD screen and built-in Wi-Fi. Additionally, the camera's body design has a wider grip that's more ergonomic looking than what's available on Fujifilm's previous models. Overall, the X-T1 looks like a monster. We're familiar with the image sensor and processing engine so we know they'll be awesome. The big question is whether the throwback control scheme is worth it. Cameras like Olympus' O-MD EM-1 have managed to retain retro style while getting a faster, more comprehensive exterior controls. 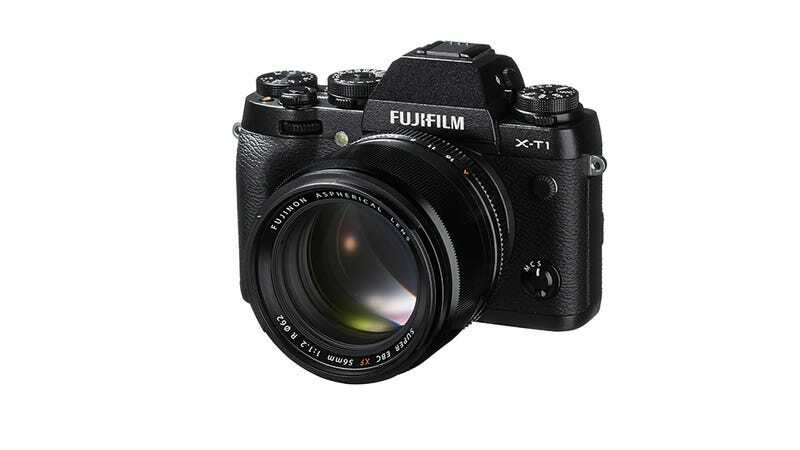 For what appears to be positioned as a top camera in its compact, interchangeable-lens line, the X-T1 is more reasonably priced than previous top Fujifilm cameras—you'll recall that Fujifilm wanted $1700 for the X-Pro1 body when that camera came out two years ago. A $1300 body is still very pricey, so we'll have to wait until we try it out to find out if it's worth it.